In a number of his writings from the Soviet period, including The Gulag Archipelago, there are ruminations on the issue of nationalism and the seeds for potential future ethnic unrest on Ukrainian territory. 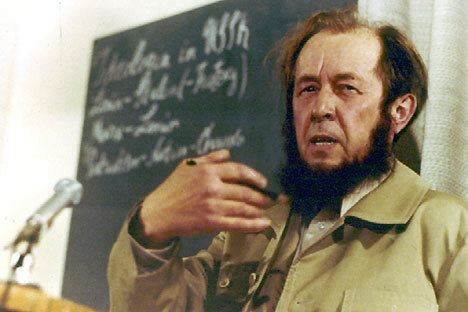 The great writer Alexander Solzhenitsyn predicted the current situation in Ukraine almost half a century ago. Writing on the issue of nationalism in his masterpiece The Gulag Archipelago, the Nobel laureate wrote: "With Ukraine, things will get extremely painful." Even back in Soviet times he prophetically did not rule out that Ukraine might break away, although with the qualification that "a referendum may be required for each region", given the way lands that had never historically belonged to Ukraine were lumped together by the Bolsheviks. To stamp one's foot and shout: "This is mine!" is the easiest option. It is far more difficult to say: "Those who want to live, live!" Surprising as it may be, the Marxist doctrine that nationalism is fading has not come true. On the contrary, in an age of nuclear research and cybernetics, it has for some reason flourished. And the time is coming for us, whether we like it or not, to repay all the promissory notes of self-determination and independence, to do it ourselves rather than wait to be burnt at the stake, drowned in a river or beheaded. We must prove whether we are a great nation not with the vastness of our territory or the number of peoples in our care but with the greatness of our deeds. And with the degree to which we plough what we shall have left after those lands that will not want to stay with us secede. With Ukraine, things will get extremely painful. But one has to understand the degree of tension they feel. As it has been impossible for centuries to resolve it, it is now down to us to show good sense. We must hand over the decision-making to them: federalists or separatists, whichever of them wins. Not to give in would be mad and cruel. The more lenient, patient, coherent we now are, the more hope there will be to restore unity in the future. Let them live it, let them test it. They will soon understand that not all problems are resolved through separation. Since in different regions of Ukraine there is a different proportion of those who consider themselves Ukrainians, those who consider themselves Russians and those who consider themselves neither, there will be many difficulties there. Maybe it will be necessary to have a referendum in each region and then ensure preferential and delicate treatment of those who would want to leave. Not the whole of Ukraine in its current formal Soviet borders is indeed Ukraine. Some regions on the left bank [of the river Dnepr] clearly lean more towards Russia. As for Crimea, Khrushchev's decision to hand it over to Ukraine was totally arbitrary. And what about Carpathian (Red) Ruthenia? That will serve as a test too: While demanding justice for themselves, how just will the Ukrainians be to Carpathian Russians? Published in Russkaya Mysl, June 18, 1981. In Russia, published for the first time in the magazine Zvezda, No 12, 1993. I totally agree that the Russo-Ukrainian problem is one of the major current issues and, certainly, of crucial importance to our peoples. Yet, it seems to me that the red-hot passion and the resultant sizzling temperatures are pernicious to that cause. ...I have repeatedly stated and am reiterating here and now that no-one can be retained by force, none of the antagonists should resort to coercion towards the other side or towards its own side, the people on the whole or any small minority it embraces, for each minority contains, in turn, its own minority… In all cases local opinion must be identified and implemented. Therefore all issues can be truly resolved only by the local population rather than in remote arguments in émigré circles, whose perceptions are distorted. ... I find this fierce intolerance in the discussion of the Russo-Ukrainian problem (fatal for both nations and beneficial only to their enemies) particularly painful because I myself am of mixed Russian and Ukrainian origin, I grew up under the joint influence of both these cultures and never saw and do not see any antagonism between them. I have on numerous occasions written and spoken in public about Ukraine and its people, about the tragedy of the Ukrainian famine; I have many old friends in Ukraine; I have always known that Russians' and Ukrainians' suffering were of the same order of the suffering caused by Communism. In my heart, there is no place for a Russo-Ukrainian conflict, and if, God forbid, things get to the extreme, I can say: Never, under no circumstances, will either I or my sons join in a Russo-Ukrainian clash, no matter how some hotheads may push us towards one. To separate Ukraine today means to cut through millions of families and people: Just consider how mixed the population is; there are whole regions [in Ukraine] with a predominantly Russian population; how many people there are who find it difficult to choose which of the two nationalities they belong to; how many people there are of mixed origin; how many mixed marriages there are (by the way, nobody has until now thought of them as mixed). In the thick of the general population, there is not a hint of any intolerance between Ukrainians and Russians. Of course, should the Ukrainian people really decide to secede, nobody would dare to try and keep them by force. But, this vastness is diverse and it is only the local population that can decide the fate of their locality, of their region, while each newly formed ethnic minority on that locality should be treated with the same non-violence. Quotations selected by Rossiyskaya Gazeta.